A US Army soldier rests in Barrio Sulok during a lull in the fighting, 1945. Image source: United States National Archives. Original Caption: Private James Harper of Hanford California, a member of Company G, 187th Regiment, 11th Airborne Division, Sulac, Batangas, Luzon, P.I. 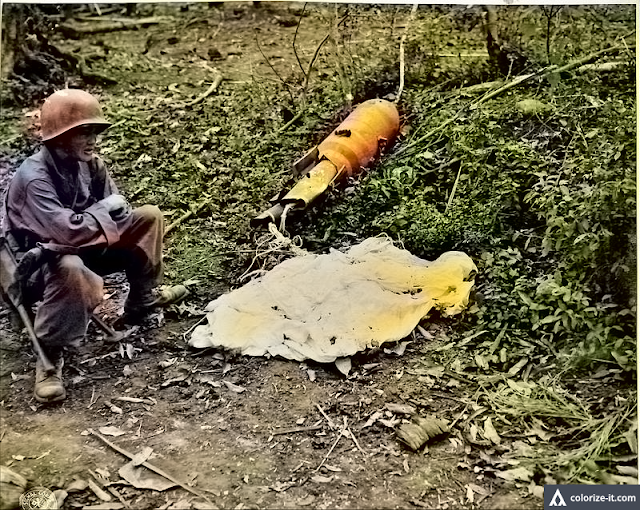 (for Philippine Islands), rests beside a dud para-bomb, during the lull in the fighting.